I first tried this "soup" years ago at a family gathering. My Aunt made it. It was one of several soups brought to our annual family Christmas party and I think the only one that was completely devoured. It was a hit with everyone, very delicious. Unfortunately, I can't post the picture (my desktop computer is down), but it's much thicker than a soup consistency. Over the years I have switched some of the things in the recipe to my family's liking, making it vegetarian. But it's a family favorite. A lot of friends have asked for the recipe and told me how much their families have enjoyed it. Picture is a day late, but at least it arrived! Brown hamburger, onion and green pepper. Drain. Then add one package taco seasoning. Simmer for one hour. Serve with grated cheese and Doritos. Top with sour cream, sliced green onions and sliced olives. You too can play with the recipe and make it to your liking. I hope you try this soup, it's yummy. If you do let me know what you think! 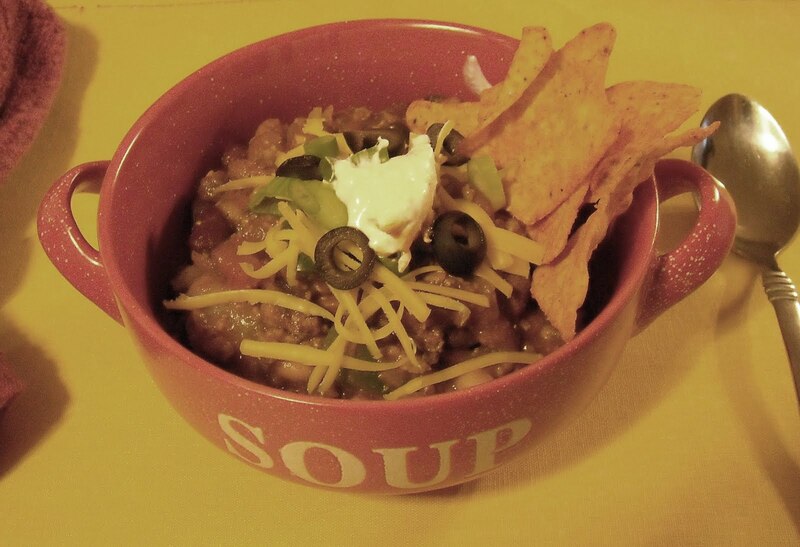 I made this soup a while back, and boy it was good !! I changed only two things about it per my husband's request: I added roasted chili peppers and some spicy Chorizo !! I made for a Mexican dinner night with friends and it was gone before I could go for seconds myself !! Very very good !! I never thought to use roasted chili peppers. I will try that next time I make it.